This is a blast from the past. See pages 10/11 of The Tech (Volume 126, Issue 55) for the original coverage. The MIT Festival Jazz Ensemble frequently featured guest performers at their concerts. 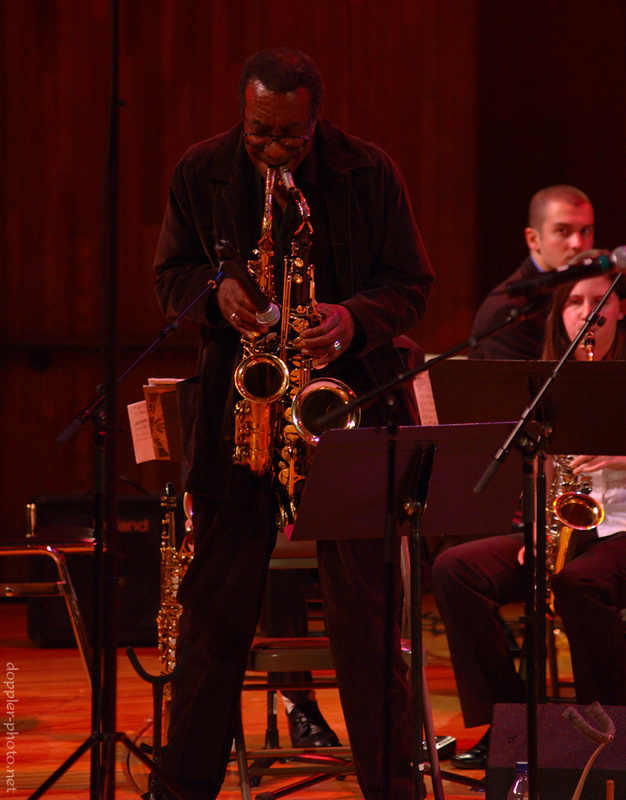 The Nov 18, 2006 concert, entitled "Saxophrenia and Other Benign Maladies," was no exception: it featured guest director Mark S. Harvey (also an MIT lecturer), as well as saxophone soloist Arni Cheatham. I only just discovered that the two had played together in the Aardvark Jazz Orchestra, which is directed by Harvey. Anyway, fast-forward to the end of the concert. The final song was "Movin' On," a piece composed by Harvey. People were trading solos left and right, and the energy was building as the close of the concert drew near. Finally, Cheatham stood up for a solo with saxes in both hands. I could hardly believe my eyes. And from chatting with pianist Matthew J. Rosario (right, rear) afterward, it was apparently a surprise to the rest of the players as well. Well, wow. Holy smokes. Certainly an evening to remember. Shades of rahsaan roland kirk!